Law enforcement agencies must publicly announce the dates, general locations, and time ranges for what police tend to call “public safety checkpoints.” This information often appears on local TV news, and it will sometimes get shared via social media. If you know police will be out in force stopping drivers to check for alcohol and drug use, you can change your usual route. You also have the right to turn off a main street if you spot a checkpoint in time to do so legally. Once you enter the cones or barricades of a DUI checkpoint, you must pass all the way through. You also have to stop and hand over your driver’s license, vehicle registration, and proof of insurance when asked to do so. No matter what you may have heard or read, you cannot invoke your constitutional rights as a reason for failing to show police these documents. If you do not have a valid license or current registration, expect to receive at least a ticket. Police can also ask for passengers’ ID, and they may run checks for outstanding warrants on the driver and other people in the vehicle. Drivers and passengers going through Columbus, Ohio, DUI checkpoints do have the right to remain silent. And they are well advised to exercise that right. Saying absolutely nothing to a police officer, though, can increase tensions and raise suspicions. Aiming for a middle ground of declining to engage in an actual conversation but confirming essential information may be the best course. For instance, not answering a question like “Where are you headed back from?” could be wise, but refusing to repeat your own name as it appears on your driver’s license could create problems. It can help to address officers as “sir” or “ma’am.” It can also help to keep all responses as brief as possible. Police train to detect slurred speech. Generally, police must ask for permission to look in a car’s trunk or to physically enter a vehicle to conduct a search. They are, however, allowed to look into any car or truck from the outside. At a DUI checkpoint, officers will watch out for containers of alcohol, drugs and drug paraphernalia like pipes or syringes, and weapons. Spotting any of these will cause an officer to take further actions, beginning with ordering all occupants out of the vehicle and usually ending with writing tickets and making arrests. Officers also use DUI checkpoint stops to issue citations for equipment violations like burned out taillights, noncompliance like lapsed registrations, and warrant checks. A majority of tickets and arrests stemming from DUI checkpoints have nothing to do with drunk or drugged driving. 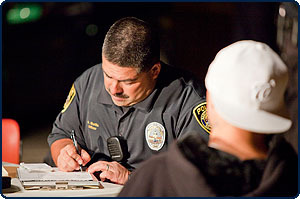 An officer at a DUI checkpoint can order a driver and passengers to step out of a vehicle at any time for any reason. The officer then has the legal authority to pat down the people for weapons and drugs. Failing to comply with orders like these will result in arrest even if no other offenses are committed or alleged. Complaints about possible violations of police procedure and suspects’ rights are best handled with the assistance of an attorney after the incident has occurred. Arguing or fighting with a law enforcement official at a DUI checkpoint will create more problems than it solves. Police in Ohio cannot order drivers to perform field sobriety tests. You can expect to be arrested for declining requests to do eye movement, walk-and-turn, and balance tests, but refusing to do so may prevent incorrectly showing signs of impairment due to physical issues that don’t allow you to pass the tests. Police in Ohio also cannot submit results from a handheld breath testing device to a court as evidence of a driver’s blood alcohol concentration. Drivers can avoid providing evidence that can be used against them at trial by saying no when asked to do field sobriety tests, and they can avoid giving police information that can be used to support an arrest by refusing to blow into a portable breath testing device. Getting a Columbus DUI defense attorney involved as soon as possible after being accused of driving under the influence of alcohol or drugs will protect your rights, ensure the fullest access to the evidence the prosecutor may use at trial, and gives you a representative for your arraignment hearing. Taking the right legal steps at the earliest stages of an OVI case makes it easier to secure a dismissal, an acquittal, or negotiate a favorable plea deal. Call a Columbus DUI attorney from The Maher Law Firm now at (614) 205-2208 for a free consultation.